Artículo ​​# 308643 Puntos Stash: 1395 (?) This is the number of points you get in The Zumiez Stash for purchasing this item. Stash points are redeemable for exclusive rewards only available to Zumiez Stash members. To redeem your points check out the rewards catalog on thestash.zumiez.com. 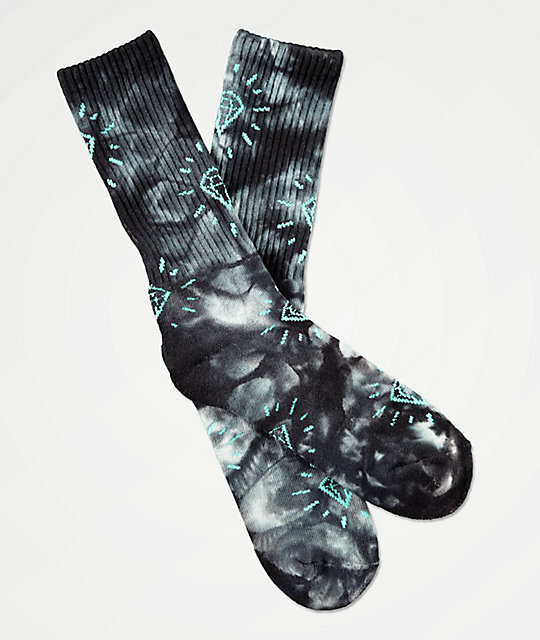 Keep adding to your sock collection with the loud style of the Diamond Supply Co. Outshine Washed Black Crew Socks. These crew height socks features a black washed dye treatment throughout for a splash of classic style, while jacquard knit Diamond logos throughout in periwinkle blue add an additional splash of color and branding. Outshine Washed Black Crew Socks by Diamond Supply Co. Crystal wash design in black and grey. Jacquard knit Diamond Supply logos throughout.